The F-100 Super Sabre may have been superseded by the superior technology of the F-105 Thunderchief and the F-4 Phantom by the Vietnam War it remained in service. The Super Sabre was deployed as an air defence fighter, and was later given nuclear capability. The F-100's toughness, adaptability and reliability made it ideal for the incessant missions that were demanded by close support and counter-… insurgency missions. 242 Super Sabres and 87 aircrew were lost during the war but their role, particularly in developing the tactics used for discovering and destroying SAM sites, was invaluable. 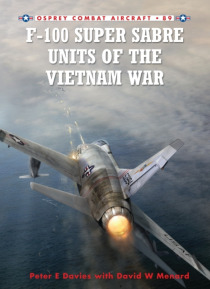 This book describes some of the most important actions that the F-100 took part in, looks at the pilots who flew it and analyses the impact of the aircraft on the war.